It will code to your existing BALL's new 7way system. Use to unlatch/unlock 2 doors (& lid) and up to 2 power windows up/down. 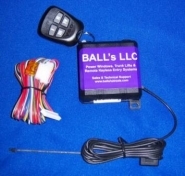 Includes receiver, transmitter, wiring harness and built-in safety feature. Made in USA w/ Lifetime Warranty.